The holiday season is upon us, and there’s a lot to be grateful for. Extra time spent with family and friends, good food, cooler weather…and plenty of startups doing good in the world. Just as in previous years, we want to highlight some of those companies that are making a difference. Have a 3-D printer? Want to help someone in need get a prosthetic? Through e-NABLE’s “Need a Hand” program, volunteers around the world have been able to give over 3,600 prosthetic hands [mostly] to children in need. Where a prosthetic hand can be costly (average prices range from $8k-$10k and some can cost upwards of $40k!) and children often outgrow them, e-NABLE has designed a hand that can be produced for around $35. Instead of patenting the design for this new hand and making a profit, the founders of e-NABLE decided to publish the design files as open-source and public domain, so that people could download and print these devices for anyone in need. Good St. has taken the very popular subscription based business model and applied it to charitable giving. Through their proprietary interactive email, you’ll also be prompted to engage in small deed that day – donating a quarter to your choice of the two charities of the day. The email will help you learn about causes you may not have heard about and you may want to get involved in. While we each are only contributing a small amount, as a community we are giving significant amounts to charity every day and showcasing how Small Change can create Big Change. Good St. also has a corporate giving option, in which companies can sponsor their employee’s donation to the tune of $10 a month. To date, Good St. has directed over $105,000 to charities across the globe. Thinx looks to disrupt the $15 billion feminine hygiene market with their anti-microbial, moisture-wicking, absorbent, leak-resistant, and reusable period underwear. Thinx focuses on removing the taboo around menstruation by creating a dialogue for women to share their period experiences shamelessly and openly. Thinx also gives back in a material way – 100 million girls in the developing world fall behind in school just because of their periods, forcing many of them to drop out. Empowering women in Uganda to become entrepreneurs through their partner company AfriPads, these women are able to sew and sell washable, reusable cloth pads. Then, a girl is able to purchase an affordable and sustainable pack of pads, keeping them in school every day of the month. 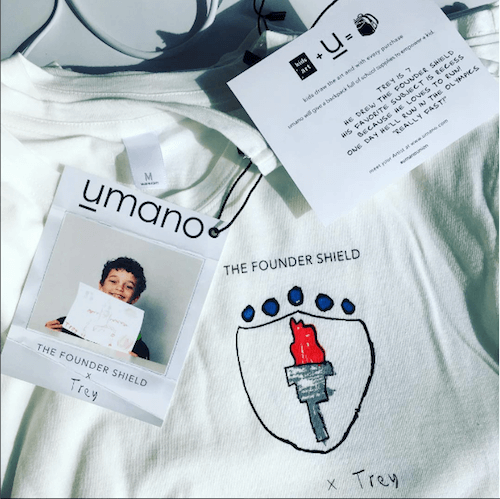 Umano shirts – Founder Shield style! Umano gives back in a two-fold way. Umano partners with art-programs in schools to help promote art education which has been proven to improve academic scores. For every product purchased, Umano will donate a backpack full of school supplies to a child in need. Rapid SOS allows you to send important information to 911 including type of emergency and GPS location to allow for a quicker response time by emergency dispatchers. You can share locations between loved ones so that in case of emergency 911 can find you. Text 911 if you’re unable to call or need to be discreet. With this life saving app, you can expect roughly a 5-minute decrease in response time.